Candy, pet costumes, and increased household commotion that come with Halloween parties or trick-or-treaters can pose a number of potential safety hazards for pets. From heightened stress levels to adverse health effects, the hustle and bustle can do damage to a pet’s health if proper precautions aren’t taken, and some may not be so obvious as keeping chocolate treats out of reach. Choose a safe costume. According to the National Retail Federation, 16% of pet owners will dress their pet in a costume this Halloween. If your pet is one of them make sure it’s safe, comfortable, and allows free movement. The American Humane Society says pet parents should avoid costumes that require tying anything around the pet’s neck that can choke them, or costumes that hang to the ground that could pose a tripping hazard. Small, dangling accessories that could easily be chewed off and swallowed should also be avoided. Keep Halloween treats out of reach. Chocolate -- especially baking chocolate -- should not be given to dogs. Chocolate contains theobromine, while candy and gum often contain a low-calorie sweetener called Xylitol -- both substances can be toxic to pets. To reduce your pet’s temptation to sneak a Halloween treat, feed them before any guests arrive. Additionally, be sure to tell your guests not to feed your pet any scraps from the table. Provide a safe, quiet space. People in costume and a busier-than-usual household environment can be scary and confusing for animals. To keep your pet’s stress to a minimum, consider putting them in a quiet, escape-proof room away from the festivities. Remember to provide plenty of food and water and make sure you or a member of your household checks on them periodically. Make sure pets have ID. 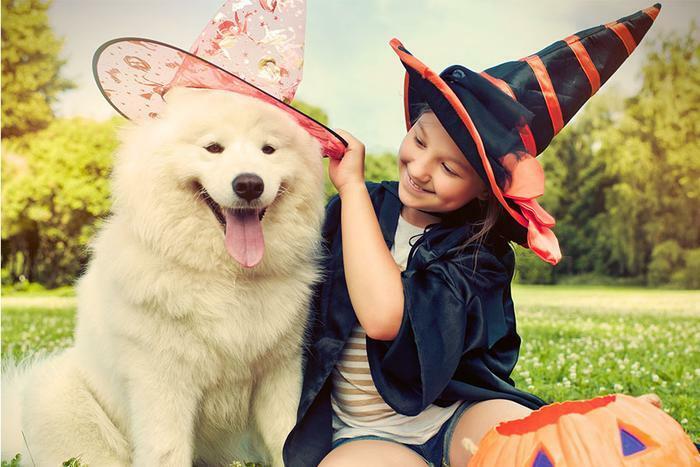 Whether your dog will be accompanying the kids to go trick-or-treating or staying home with you, it’s important to make sure your pet has proper identification. Current, securely attached identification tags will improve the odds of your pet returning home if they happen to slip away. Microchips are even better, since they can’t be lost by pets. Be sure to watch the door to keep your pet from darting out the door when the doorbell rings. Avoid dangerous decor. Candy wrappers, paper decorations, and other fall decor can be dangerous if consumed. Keep seasonal decorations and jack-o-lanterns with lit candles out of paw’s reach. Faux candles or glow sticks can used in jack-o-lanterns to reduce the risk of a fire or pet injury.